I just received my TC20 that I bought from Thrunite directly but it surprisingly came in an Amazon Prime box! The light is bigger than I thought especially because I had a DN70 and currently own a DQG Tiny III 7xXPG2. The TC20 is bright but the hotspot is tighter than I like and I don’t like the green around the hotspot and bluish hint in the large spill. Beam and tint wise, I much prefer the Haikelite SC02 MTG2 5000k and DQG Tiny III NW (I estimate 3800k to 4000k) with more creamy tint and larger hotspots. I just can’t stand yellow or green tint. Is your light NW or CW? Thanks Dale, and thanks Robo for the close up photos. I just received my A3s today and yeah although the knurling is much better than most, it’s definitely not in the same class as Thrunite’s. But I’m real happy with it. Even the 70.2 neutral is not even close to as nice as the MT-G2. I agree even my tc20 cool white have hint of green at low output.. i am not worried much.. this light is great for me. I know i am getting a good quality light from thrunite. beam0, I put a de-domed XM-L2 U4 in my A3 with an FET with ramping firmware, makes it a pretty wicked little zoomie! I don’t notice all these rainbow issues using the light outdoors, only if I shine it against a white wall. But even then it’s not enough to concern me, it has a nice neutral tint. Anyone know where to get this “perfect neutral” emitter? Just got my NW in the mail today. It’s tiny, and I love it. I can’t wait to take it outside! How does it handle heat on 3800lm Turbo? I ordered one from the thrunite website… there is a warning that it is not expected to ship until 04/15/2018… is that kind of delay what others have experienced? I haven’t had a chance to test it’s heat handling but I’m sure other reviews out there mention it. They ended up shipping it from their amazon Canada store. Very impressed. Here is Temp. /Runtime chart from ZeroAir Reviews. 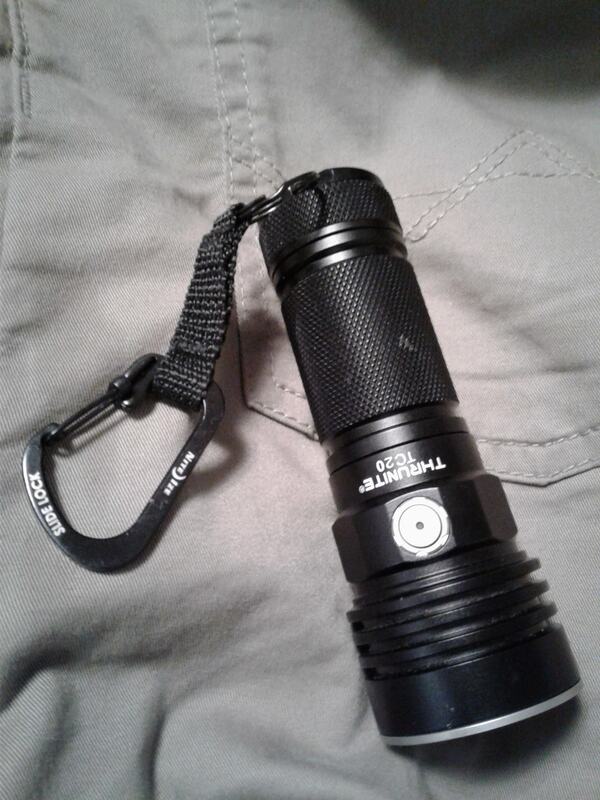 I am a flashlight newbie.I ordered the Thrunite TC 20 via Thrunite with the 20% discount on Feb 22 and recieved Feb 25. The light is small and very bright. I had it on Turbo for 7 minutes without overheating. I didnt notice a great difference between the high 1800L and the Turbo 3800L will a different battery give more output? What batteries 26650 work with this flashligh? 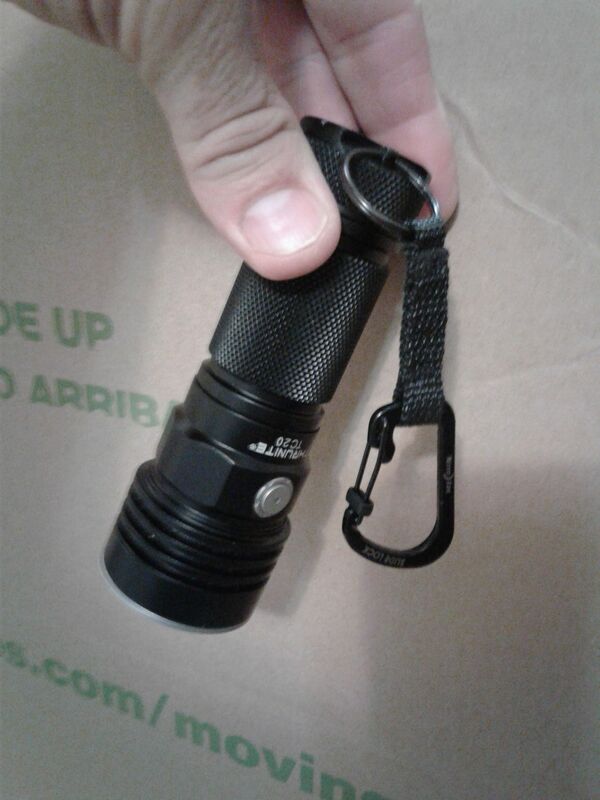 I sent an email to Thrunite for a pocket clip but non available, anyone know where I can get a pocket clip for this light ? I dont notice a great difference between the high 1800L and the Turbo 3800 will a different battery give more output? What batteries 26650 work with this flashligh? The TC20 also works with the current best unprotected cell, Shockli 5500mah (measured at 5,948mah), and best protected cell, Xtar 5000mah (measured at 5,224mah). In comparison the included Thrunite 5000mah protected battery measured at 5,335mah. I think the Thrunite and the Xtar are the same batteries. I tested the TC20 NW with the Thrunite 5000mah, Xtar 5000mah Protected, and Shockli 5500mah batteries and they all gave the exact same lux readings so you won’t gain any output by using another battery. Thanks for the temp comments. 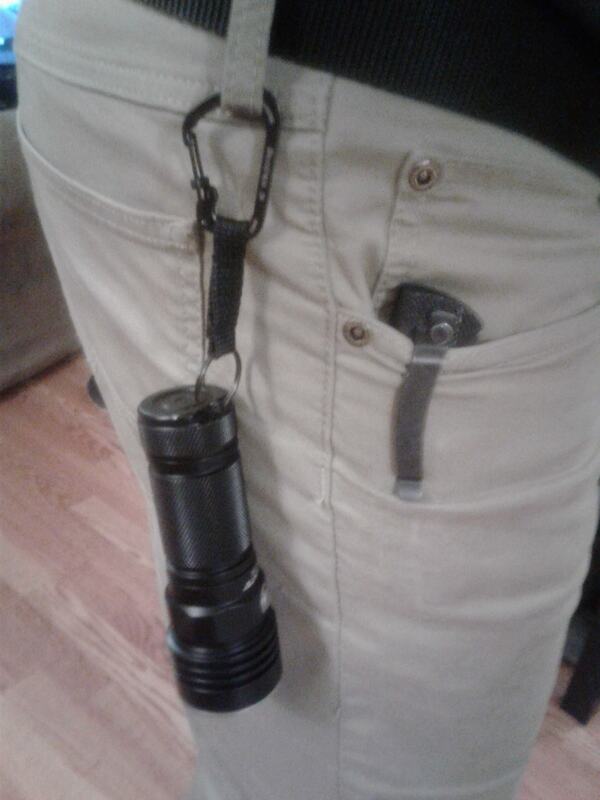 anyone know where I can get a pocket clip for this light ? Any recommendations for a better holster ? 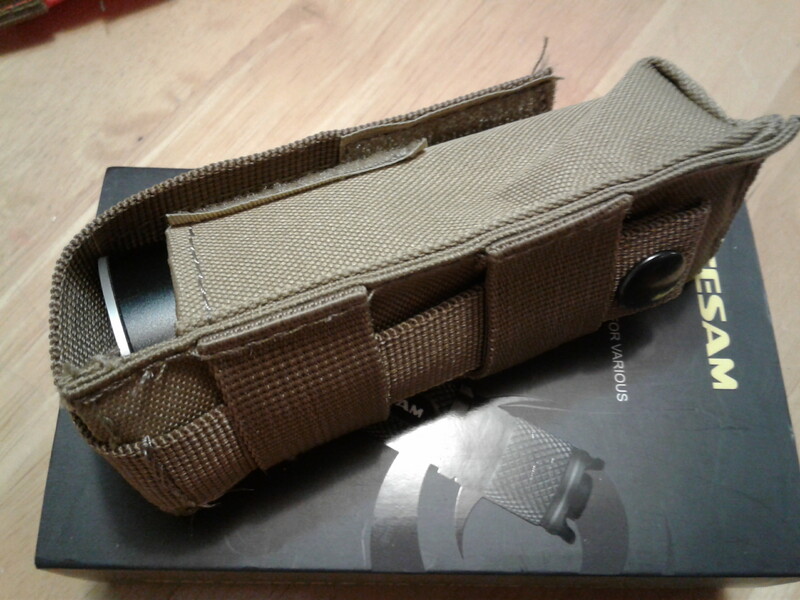 The Olight R50’s holster looks like its better quality and more heavy duty any other recomendations ? 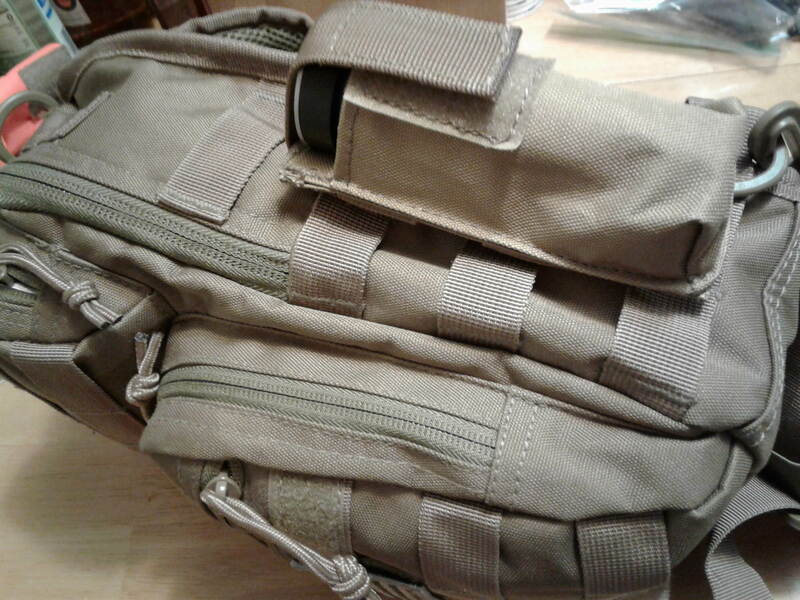 It has 2 flaps, the thinner flap fits better on the velcro, (last photo) there’s a pocket to tuck the wider flap into to hide it out of the way. There are several listings from other sellers for this same pouch, I also got an orange color one but the tan one fits it better. I was also looking at one of these nylon open top style holsters, none of the ones I already have are big enough, after looking at dozens of them online I found this one to be the best candidate, by the measurements it should fit it perfect, but I won’t know for sure till I get one to try. 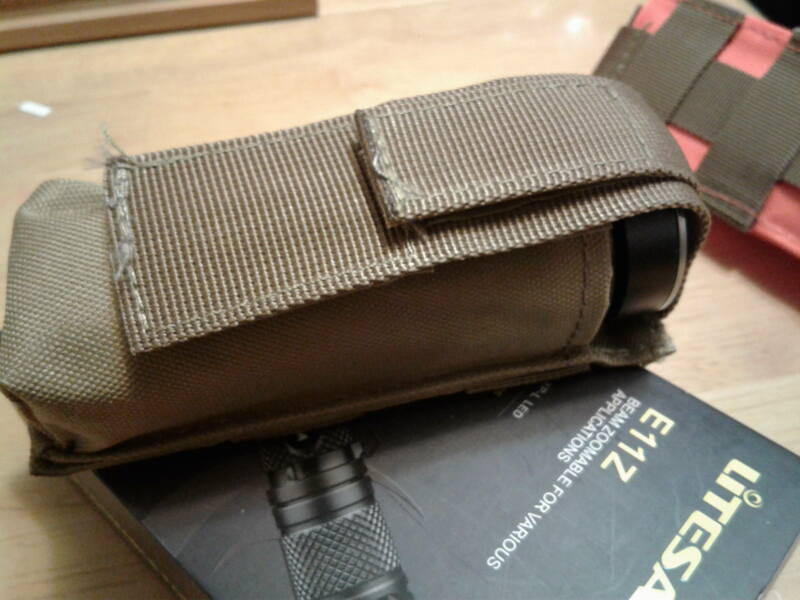 I’m also working on making a custom open top holster out of leather & kydex with a metal belt clip, and after that I’m going to try and make one all kydex. I really prefer to have a metal clip rather than the nylon belt loops. I’ll post about those here as I get them done. What's the average time to step down from turbo to 1800l m? Mine has not arrived yet, but I sort of regret ordering it now that I know it has a very tight hot spot instead of a more even flood. kirman, the hot spot isn’t really all that tight unless you take steps to make it so. The reflector is comparatively shallow and orange peel in texture with the big XHP-70.2 so the hot spot at any real distance is quite large. It has been widely reported to have a nice spill that’s useful as well, so it should be very much an excellent general purpose light in stock form. I saw the same expected ship date when I ordered mine. I was therefore surprised that it shipped in about 4 days. They are shipped from the USA from Amazon wharehouse.However this light is very popular. I ordered on Feb 22 and recieved on a Sunday Feb 25. I think DC-Fix should be able to fix the tint shift and diffuse the hotspot as I’ve done it on over a dozen flashlights already. However, I still wish Thrunite used the A and D (rosy) tints instead of the B and C (yellow greenish) tints. DC-Fix does not change the tint. But yellow/green on this light is not as bad as some of the other lights I’ve seen. Your order was on good timing. 2nd batch preordered, they shipped it on feb 13th..
Just when I think I'm the only one that does things like that I read your post! The TC20 is boosting a 4.2V cell to supply a 6V emitter so the actual current draw from the cell is going to be close to 50% more than current supplied to the emitter. The DQG is boosting a 4.2V cell to supply 21V to the 7 emitters at 1A actual emitter current in Turbo. So the DQG is probably hitting the cell harder in the long run. I know this about the DQG because I modified mine to take a Cree COB at 21V 1A. (It’s technically an 18V COB but requires 21V to run 1A current at the emitter. At this level, as supplied by the stock DQG driver, it produces 2004 lumens out the front from the mule configuration with an AR coated lens.) I have this COB also as a light source for my Carolina Reaper, running on a power supply, and at .450 mA to the emitter it,s burning through 17.18V. This where I set it with the light within 2 inches of the plant. This is supposed to be a 96 CRI COB. At any rate, the TC20 should be more efficient on the cell, runtimes should be correspondingly longer.